Trophy Size (including base): 11.75"
Our Rise Trophy Series – Soccer edition features a variety of striking trophies for your soccer stars. This particular trophy in the series features a soccer ball column surrounded by a wreath. Top each trophy with a Figure of your choice. With both male and female figures in a variety of actions, you’ll be able to create a completely unique award for your soccer team. 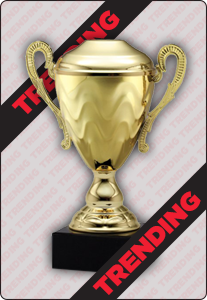 Personalize each award by utilizing the engraving plate featured on the base of the trophy. Our typical lead time with this product is 10 business days.